It's Friday and my first week back in the city, away from my family, is coming to an end. I miss them all so much. 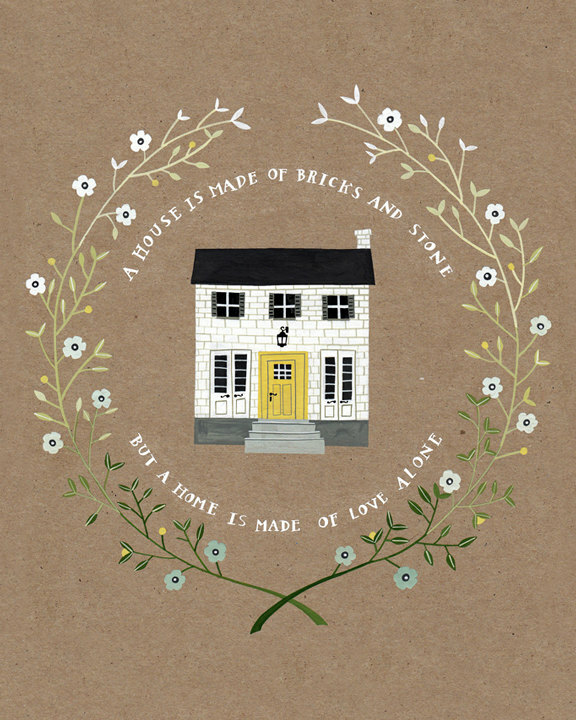 When I saw this lovely new print by Rebekka Seale the other day, I thought that it perfectly captured the way I have been feeling since Andrew and Glasgow left after bringing me "home" to Montreal last weekend. Except that Montreal isn't my home anymore, even though most of my belongings are here, and my daily life will be here for the next couple of months. If "a home is made of love alone," then my home is with my lovely little family in Laurentian Valley, where all three of them are patiently (or perhaps not-so patiently) waiting for me to come home. It is strange living in two places and leading what feels at times like a double life, but it is also deeply comforting and warming knowing that I have a real home somewhere, even if it isn't here. Where do you feel most at home? Is home a place or more of a feeling? On a happier note, the weather forecasted for this weekend is full of sunshine and warm temperatures, so I think I am finally going to break out of the house and explore the city, and maybe even participate in some St. Patrick's Day festivities.